Amazing Grace: Aretha Brings The Mountaintop Down to South Central L.A. - TheUrbanMusicScene.com | Music Reviews! There’s something powerfully unique about seeing footage of music you’ve only been able to listen to for decades. The first example that comes to mind is the black and white video of Les McCann & Eddie Harris’ 1969 set at the Montreux Jazz Festival that, for years, was only heard as their Atlantic Records album Swiss Movement. When Rhino released the footage as a VHS home video in the `90s, it looked nothing like I had imagined yet was still a joy to behold. Aretha Franklin’s “Amazing Grace” originally arrived to the public as what became the top-selling Gospel album (2-LP set) of all time – recorded Thursday and Friday January 13-14, 1972 in Los Angeles at New Temple Missionary Baptist Church. 47 years later, watching Aretha sing the Spirituals and Christian-slanted Soul-Pop songs in grainy early `70s color film is even more of a mind-blower. Aretha, then-also an Atlantic Records artist, raises goosebumps and heightens all senses with her big screen presence. Buoyed by singer/pianist/host Reverend James Cleveland – a family friend – masterful and animated Musical Director/Arranger Alexander Hamilton leading The Southern California Community Choir, her handpicked New York powerhouse rhythm trio of drummer Bernard Purdie, bassist Chuck Rainey and guitarist Cornell Dupree fleshed out by home church ringers Kenny Lupper on organ and Pancho Morales on conga drums – Aretha has every musical element she needs to deliver a righteous soul service to the people. It might not resemble anything you imagined (especially since the album cover depicted Aretha wearing a headwrap and African wardrobe sitting on the steps of an entirely different facility), but disappointment never enters the picture as we admire her – Afro-resplendent – in outfits of baptismal white or royal emerald, pouring the roots of her gifts out in cascades of aural holy water. Every song is a highlight. Opening at the piano singing Marvin Gaye’s “Wholy Holy,” then-new from his now-classic What’s Going On LP, Aretha pays heart-stopping homage to a peer in her same position of being a Soul superstar struggling with criticism for stepping outside of the canon of church songs. Eyes squeezed shut, she caresses Gaye’s prayer with focused devotion supported by a step-out trinity of female singers in front of the choir. The camera adores her – be it in many enraptured closeups…or framed by the crescent curve of the piano or between the blur of Purdie’s drumming sticks. Aretha also sings a medley of the spiritual “Precious Lord” mixed with a big pop hit of the day, “You’ve Got a Friend,” from the pen of Carole King. How fitting that her soul brother Donny Hathaway, too, recorded a churchy rendition of the song in August of `71 a little further up the road in West Hollywood at The Troubadour club, documented on his ground breaking Donny Hathaway Live LP on Atco. At this point it is imperative to remember that this was, first and foremost, a recording session – an opportunity for Aretha to document her roots as a Gospel singer before a live audience in a church instead of a studio – after a decade of international success as a blues, jazz and soul singer. The audience was not a Sunday congregation but a collection of pan-generational locals – beautifully gifted and Black – and invited guests. The venue was a converted church – formerly a movie house – and not a very big one. Warner Bros. negotiated an opportunity to film the proceedings as a planned but scrapped television special to coincide with the record. On Night 1, the church was three quarters full. Night 2: over-capacity! The camera even catches Rolling Stones lead singer Mick Jagger – in back at first then later right upfront – soaking in the experience. “Amazing Grace” had a long, circuitous road to release. The footage was originally shot by Hollywood veteran Sydney Pollack whose oversight of clapper board designations per song made syncing visuals to sound too arduous to undertake. Add that Ms. Franklin had strong reservations about rights to use of her likeness and that she was satisfied with its success as a record. It took director Alan Elliott – a UCLA music professor – to purchase the footage then take on the assembly of the elements to get the film done. And even after he had a rough cut, Aretha was not convinced. The film is only out now because the family climbed onboard shortly after the Queen of Soul’s passing last year. “Amazing Grace” works tremendously well as a concert film. But it has been entered into several film competitions as a documentary which is questionable. It did not make the top 5 qualifiers for an Oscar but beat out strong, deeply probing multi-media pieces on Quincy Jones and Whitney Houston, among others, for an NAACP Image Award. Beyond a few paragraphs of information onscreen at the beginning, the film is a straight, tightly edited reveal of the concerts with a few shots from a rehearsal and a little behind the scenes coloring. In an approach that borders on cinema verité and guerilla, the footage shows cameramen and sound people scrambling for position in the small South-Central L.A. church. Elliott makes sure to include choice shots of original director Pollack candidly discussing his visual plan for the rehearsal to concert transition on the aforementioned “How I Got Over” and an in-the-heat-of-the-moment command to cameramen to be sure to zoom to the left to catch audience members rising en masse in ecstasy. It was logistics that dictated these musical church services be captured in L.A. as opposed to Detroit where Aretha’s father, Reverend C.L. Franklin, had long held a church that would be considered Aretha’s home base. The audience in L.A. is spirited enough but not an actual congregation – anyone who wanted to attend was able. Couple this with James Cleveland actually prepping the audience that when the camera comes by them to feel free to cut a step or catch the holy ghost and one can imagine just one reason why Aretha may have felt uneasy about this reveal. That Elliott included Cleveland’s goading onscreen twice plants irksome thoughts about whether everyone’s reactions were all-natural…though the music as we see and hear it certainly warrants the enthusiasm received. In the end, it is the music that is beyond critique as the contribution of all of the singers and musicians involved – their rousing playing with utmost sensitivity to the needs of Sister Franklin upfront – freed and inspired “Lady Soul” to sing for the heavens. Night 2 offers up glory upon glory beginning with “Mary Don’t You Weep,” sadly truncated on film though it was selected as the opening number of the album and has since been immortalized as part of the score for Alvin Ailey’s brilliant dance work “Revelations.” Franklin and Cleveland are captured split screen at one point during “Climbing Higher Mountains” urging each other on after Aretha initially stopped it within 30 seconds to make sure that they nailed the pocket of her daddy’s song…which leads to some spirit-catchin’ footwork from the audience and even some choir members behind her. Aretha soulfully taps on the pulpit as she belts out “Old Landmark.” Then comes Cleveland’s introduction of Aretha’s father, Rev. C.L. Franklin, to say a few words about watching Aretha grow up to become a “stone singa” that can rock a “synthesist” (sic) of Gospel and Pop. Aretha does her father proud as she brings the evening to a close alone at the piano singing “Never Grow Old,” as in the film’s beginning, with her eyes tightly shut and her heart wide open. It is so amazing to watch how Aretha’s focus never wavers in spite of her father jumping up to mop her sweat-soaked face mid-song, the antics of Gospel great Clara Ward and her mother blissfully falling out in the front row nor the presence of a big Grizzly Adams-lookin’ cat with a film camera inches from her face from behind. Aretha never misses a beat. She is at-one in her universe, testifying to God and – in that moment – all is righteous in the world. The peanut gallery has made much of the perspiration on Franklin’s face from the hot lights required for the film cameras. She does not work up that sweat giving us happy feet (which she is known to do). She’s got to stay on that mic. The sweat emanates from her desire to make a great recording, her poise through technical difficulties and the pressures that a queen – in a waiting that is soon to be over by year’s end – feels when aiming to represent to the fullest. And there is nothing cooler than what Aretha and Alexander do when Cleveland asks the audience to turn to their neighbor. 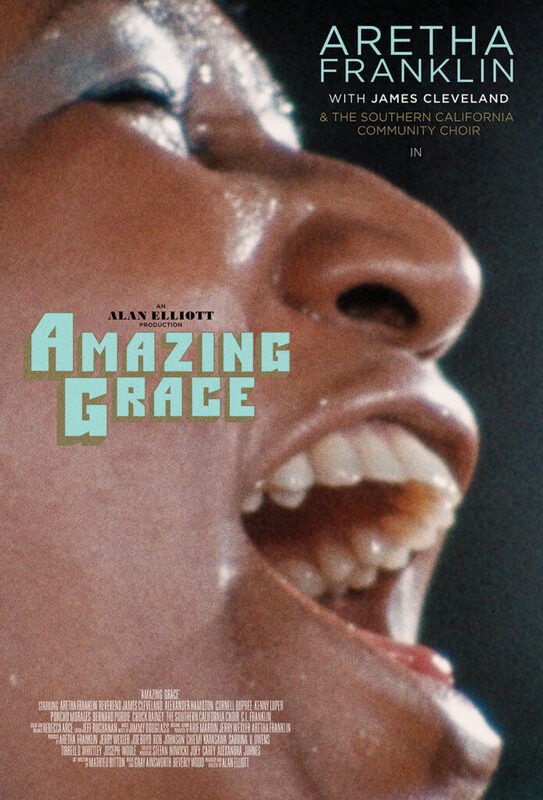 “Amazing Grace” surely will do very well as a theatrical happening and later for home video where many bonus features are rumored to be added. Seeing Aretha, Cleveland, Hamilton and the choir, plus hearing them in a newly commissioned sound mix by the great Jimmy Douglass, is an experience everyone should have. The sea of Black faces circa `72 in all their rich textures, fancy hairstyles and fashions ranging from street to Sunday best, are soul-stirring to behold. There is no other feature length filmed offering of Aretha Franklin on the market but that is sure to change if there is any justice. “Amazing Grace,” capturing her in peak early `70s form, is a righteous keepsake of musical mastery and faith personified. P.S. : Bring friends…and on the way in, request that the projectionist bump up the volume – in the name of Jesus!